Some people were made to score the basketball and Doug McDermott is one of those guys. He ranks fifth all-time in NCAA history in points and led the nation in scoring in each of the last two seasons. He has one elite skill and that is his shooting ability. Whether he is spotting up, pulling up off the dribble, or coming around a screen, McDermott can knock down jumpers from any distance. He is also incredibly efficient on offense, posting high percentages despite a high usage rate, and taking care of the ball while doing so. Playing power forward in college has also allowed him to develop a very solid post game, which he can use to punish smaller defenders. Despite lacking great size or athleticism, he was a solid rebounder in college due to his understanding of how to use and position his body. He has a very high basketball IQ thanks to his dad being a coach and he knows how to play the game. He has the IQ to become a decent team defender. He has great work ethic and has shown that he can add to his game. Many scouts wonder if McDermott is just an excellent college scorer who won’t be able to get his shot off at the next level, much like Adam Morrison before him. While he had some great games, he also struggled at times when matched up with elite athletes, especially those with length. Defensively, he has no position. He lacks the foot speed to guard wings and the strength to guard power forwards. He will have to be hidden on that end of the floor for the time being. He also is historically bad at creating turnovers, totaling only 34 steals and 15 blocks in his entire Creighton career. He is going to have to find a niche in the NBA as he won’t be the dominant scorer he was in college and it is unclear whether his IQ will allow him to overcome his physical limitations. If he is able to improve his ballhandling, he has a chance to carve out a career similar to Peja Stojakovic. But that is a best case scenario. His shooting will give him a job in the league, but his physical attributes could seriously hinder any chance of a significant impact. Doug McDermott, well what can we say that hasn't already been said about this guy. He is a player that scores from inside, outside and everywhere in between. Doug is 5th all time in NCAA Div 1 scoring with 3150 points. He was honored with the 2014 Naismith and Wooden Awards, and was the Big East player of the year in 2014 too. He also led the nation in scoring with almost 27 points per game. So how will his game translate in the NBA? And who can he be compared too? In the Association Doug will use his 6' 8" and 225 lbs frame to make room for nice little 10-17 foot jumpers. As screens are set, he will get open for even more shots and use is strength to drive the lane. He is not as quick and explosive as other small forwards in the draft, however he is very skilled and gifted. He is perhaps similar to Josh Smith and Paul Pierce. All three score from all over the court and have similar body types and style of play. Of course Doug has a long way to go before he potentially measures up to those two, but he will get stronger and put on more muscle over the years. 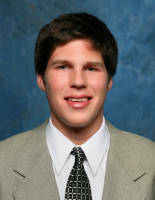 Creighton's Doug McDermott -- SportsCenter's "King of the Night"